Apple has reportedly extended an internal test of its forthcoming Apple Pay Cash feature to include retail employees, a report said Friday, suggesting the peer-to-peer payments solution is ripe for public release. Apple began rolling out the feature to retail employees today, asking workers to install the latest iOS 11.1 beta and a special device certificate in order to enable the P2P function, reports MacRumors. Employees taking part in the internal evaluation are required to whitelist iCloud accounts in order to use the service. Evidence of the Apple Pay Cash test first surfaced earlier this month when select corporate employees were granted access to the feature. With an expansion into Apple's vast retail workforce, the company will be provided with a much larger dataset from which to detect and squash bugs prior to release. Today's report comes with a few new screenshots of the Apple Pay Cash setup process, which requires users to verify their identify by providing a full name, address, social security number and date of birth. According to Apple, the information will be verified using an unnamed identity verification service. Unveiled at Apple's Worldwide Developers Conference in June, Apple Pay Cash is Apple's branded peer-to-peer money transfer solution. 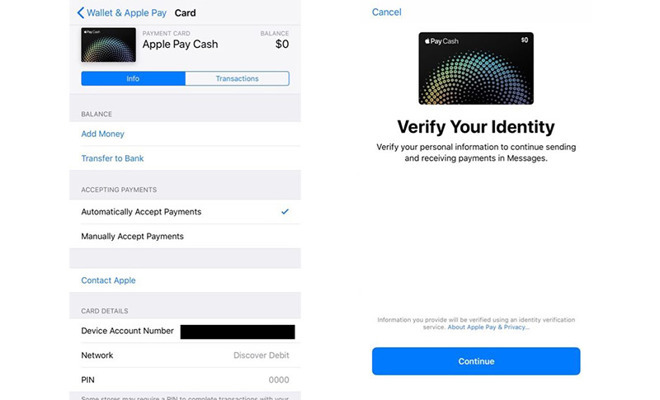 Authorized by Apple Pay and integrated into the Messages app, the service lets verified users send payments to other Apple Pay account holders via a simple text interface. Received money is converted into an Apple Pay Cash card that can be used to pay for online or in-store Apple Pay purchases or transferred to a linked bank account. Both iOS and watchOS devices support the feature. Like other P2P systems, Apple's version supports both credit and debit cards, though only debit-based transactions are free. Payments accomplished using a credit card incur an industry standard 3 percent fee. Apple Pay Cash has yet to appear in beta versions of iOS 11.1 issued to developers and public beta testers, but it will likely be included in a final release if the current evaluation process is successful.